Things we did today...: Where In The World Is Baffle Point!!!? We spent a lot of time studying and planning where the possible stops in our next Cruising chapter would be. We had to leave Clear Lake Shores eventually and it looked like our weather window opened up on November 9th. We had been at the Portofino Marina for THREE WEEKS! It was time to go! Many of the locals we spoke to about possible anchorages had some good advice... but not many of them had ever heard of the first anchorage on our Float Plan... Baffle Point. Those who HAD heard of it, looked at us like "Why would you ever want to anchor THERE?". 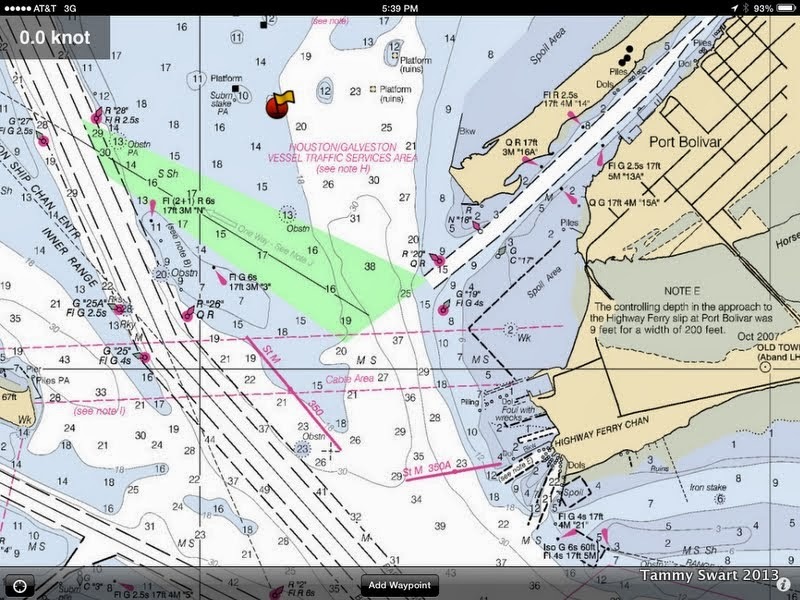 Word is that its a very rolly spot, from all of the ships traveling up and down the Houston Ship Channel. Well, we weighed the alternatives and settled on Baffle Point anyway. I must admit that I discounted the warnings as being exaggerations... I'm sure it's FINE! We left the marina with heavy hearts, topped off the fuel tanks and motored out the Kemah Channel and across North Galveston Bay. We dodged the day sailors, also enjoying our perfect weather window, and entered the Houston Ship Channel. I will tell you that I was nervous. I had become soft from our days in the nice safe slip with lots of amenities. But other than a little Mal-de-Mer incident with Jezabelle, and one Tanker Captain who asked us none too nicely for a little more space... things went very nicely and we were turning out of the channel and motoring towards our waypoint in just over four hours. We anchored in a different location than Active Captain shows, opting to use the waypoints given by a friend, which were very close to Skipper Bob's lat/long. It is tucked just inside Boliver Peninsula and provided a perfect staging point for our leap into the ICW come 6:30 the next morning. We settled in for the evening and enjoyed the sunset. We watched the huge Cruise Ships and Tankers go by in the distance and remarked "Yes, it's a little bit rolly, but it's not really THAT bad...". We ate dinner and went to bed early in preparation for our dawn departure. Good thing we DID go to bed so early... we were both awake half the night from the intermittent rocking and rolling, compounded by the squeaking from the dinghy swinging ever so slightly back and forth... Neither of us wanting to leave the warm bed and go out to fix it! So, we struggled through until morning thinking "Maybe it would have been better to choose a different jumping off spot if there is ever a next time". We finally gave up sleeping at about 4:30 am and started preparing ourselves for our day. We were pulling the anchor by 6:30 and motoring towards the ICW, still excited but with a fuzziness about us. Suddenly... there was the ICW! No dodging traffic, no slipping in and out and between barges and ships... We were IN! It took, like, ten minutes! It CAN'T be this easy! But it WAS! We made our way easily through all the barges lining the shores without a peep. We later listened as the VHF chatter on channel 13 began to hum with the movements of those previously sleeping barges. We would have been in the middle of that mess if we had stayed ANYwhere else but Baffle Point. Suddenly, our less than perfect night was looking a whole lot better! LOVE that it's going so well for you guys! We really can't believe how well it's going! We are SO SO loving this life! Thanks for hanging out!